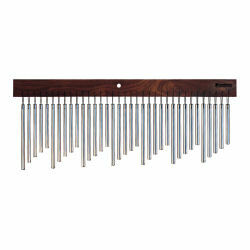 Tree works Echo Tree-35 Bars Ethereal Tune The EchoTree has a unique tuning that brings a haunting, new sound to the table. The effect is reminiscent of a siren that changes pitch as it passes you by. It begins with a group of five notes that repeat seven times over. Each time the sequence repeats, it is lower in pitch. The EchoTree is hand-tied with braided cord that can hold 50-lbs, .35 aluminum/titanium bars, and Tennessee Black Walnut.